We love to indulge our senses. Local culinary has made a nice modern twist in the last years. But the main hint is, that the best restaurants are hidden around random locations. For example in Portoroz you can dine the best daily catch in a cozy local restaurant. In Piran you can taste some modern cousine under the spoon of a very creative chef. Bernardin is home to the restaurant that is leading in modern culinary fusion between regional ingredients and local heritage. In the hills beyond Portoroz you can find a modern design restaurant that will capture your senses with an innovative menu selection. Slovenian coast is home to some of the nicest vineyards in Slovenia. With wonderful views overlooking the sea and vast valleys you can experience the great hospitality in each one of them. Either you decide to visit a number of wineries with wine tasting accordingly or decide to organize an event for larger groups we can create your experience accordingly. Portoroz is the largest seaside resort in Slovenia. 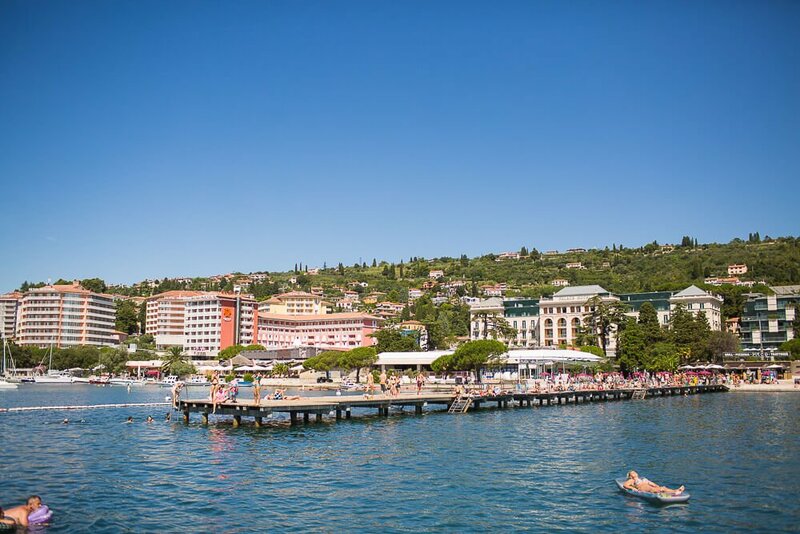 Dating back to the the Austro Hungarian era in the late 19th century, the health resort of Portoroz saw its bloom. With a wonderful mild climate the visitor started to visit in summer months, new hotels were built as many private villas. Still nowadays you can witness the era when admiring the might Hotel Palace Portoroz. For a perfect gateway from spring to early autumn the best way to enjoy the destination at most is to be an active part of the sea activities. From sailing to seaside riviera cruise, sea will make you feel free. Slovenian coast has a nice network of biking routes. From the hills to the valleys, from seaside to the cities. Starting from Portoroz you can easily have everyday a different biking route to follow. From Portoroz you can visit the nearby Croatian Istria, within a good hour. Nice beach locations, historical cities and Istrian heritage are a nice option to be explored while in Portoroz. Trieste is the closest biggest city to Portoroz. After Koper in just a few minutes away you are in Italy. Visiting Trieste will offer you a concentrated Italian experience. The beautiful Miramare castle gives a historical note. Italian restaurant and pizzerias offer some wide selection of dining options. Do not forget the shopping district where you can shop “till you drop”.